I'm using Fedora for my DTop and for some time I've had two SELinux warnings during boot complaining about "Multiple same specifications" for some VLC files. Tonight I finally did something about it and found a spot on post on LinuxQuestions.org by lonecrow called SELinux "Multiple same specifications" annoyance , where macemoneta gives the answer. What the hell, had my system been compromised for I know not how long? Luckily it hasn't (hopefully) since it's an anti-feature of Fedora that logging to boot.log is disabled. You can read for yourself on Bugzilla Bug 151238: boot.log is empty - it's a very old bug that's been in the frozen zone for some time and obviously didn't even get fixed in the most recent dist: Fedora 8. I'm surprised that something that fundamental isn't working, but instead of just complaining I'll have to sign up for bugzilla and give my vote cause I sure can't change it myself. In my personal opinion Web Services Security is the most successful addition to the web service SOAP stack, often called WS-*. It was much needed and avoided to run into conflicts between the big market players, which to the contrary one of the other much needed abilities, that of adding reliability, ran into big time. Some might argue that WS-Addressing is equally successful and it is important, but for one the standardization process took much longer and secondly (again a personal one) I've primarily been using web services in synchronous mode (in-out) and not in complex flows, so I've not had much need for it though I've had to live with it. It's been some time since I last used WS-Security and it was back in the early days of WSS4J and Axis1. In the meantime Axis2 has evolved with a new architecture and nice features like native XMLBeans support. For WS-Security it's still WSS4J with support for Web Services Security v1.0 (March 2004), and as far as I can tell support for Web Services Security v1.1 (February 2006) is not that far away. With Axis2 the days of adding handlers and adding parameters with generic name/value constructs are over. Now the Axis2 architecture is build on Flows, Phases, Handlers, and Modules (From the OxygenTank) and there's a seperate module, called Rampart, that plugs WS-Security support with WSS4J into Axis2. The Axis2 guide for using rampart: Securing SOAP Messages with Rampart practically covers it all, but for new comers there's a great set of samples covering about just all practical scenarios of using WS-Security. In this post I give an quick overview over these samples. Note: Rampart does have it's own subsite, but it does not look like it's being maintained since the last release here is still 1.2. There are 11 examples bundled with the current Rampart. It's all configured with two parameters named InflowSecurity and OutflowSecurity in the files services.xml (server side) and axis2.xml (client side). I'll now go through all of them with the central configurations and a mix of the comments that come with the samples and my own. I'll not show any of the code, for that you'll have to look at the samples yourself. The first sample actually does NOT add WS-Security, and shows the basic service that's used and the needed Axis2 configuration. Thereby also showing that Apache Rampart does not work on the messages when simply engaged without any configuration (parameters). 4   ! Copyright 2006 The Apache Software Foundation. 7   ! you may not use this file except in compliance with the License. 14   ! WITHOUT WARRANTIES OR CONDITIONS OF ANY KIND, either express or implied. 16   ! limitations under the License. So adding the module doesn't do nothing in itself, contrary to the behavior of WS-Addressing. The client is configured to add a UsernameToken to the outgoing message. The service is configured to process it. Note how org.apache.rampart.samples.sample02.PWCBHandler supplies the password to wss4j to compute the digest for comparison. The client is configured to add a UsernameToken to the outgoing message. 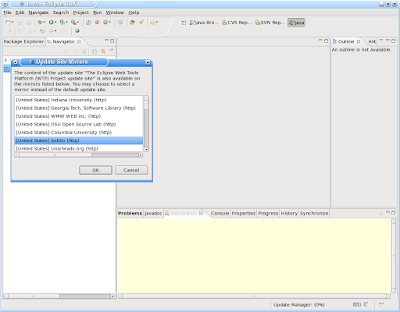 Note the <passwordType>PasswordText</passwordType> element. The service is configured to process it. Both client and servce are configured to sign the outgoing message and to verify the signature of the incoming message using their key pairs. Both client and servce are configured to encrypt the outgoing message and to decrypt incoming message using their key pairs. Both client and servce are configured to first sign and then encrypt the outgoing message and to decrypt and verify the incoming message using their key pairs. Both client and servce are configured to first encrypt and then sign the outgoing message and to verify and decrypt the incoming message using their key pairs. The client is configured to sign the outgoing message twice. Note the aditional <action>> element that defines the second signature (client side) and that we simply use "Signature Signature" as action items (server side - here). Encryption with a key known to both parties. Both client and servce are configured to encrypt the outgoing message and to decrypt incoming message using a known named key. Sign and encrypt messages. Both client and servce are configured to first sign and then encrypt the outgoing message and to decrypt and verify the incoming message using their key pairs. 11. Dynamic configuration : Get rid of the config files ... let's use code! Note that we don't use any parameters in the client.axis2.xml, see org.apache.rampart.samples.sample11.Client's getOutflowConfiguration() and getInflowConfiguration() methods and their usage. I've been a happy Eclipse user for some years now. 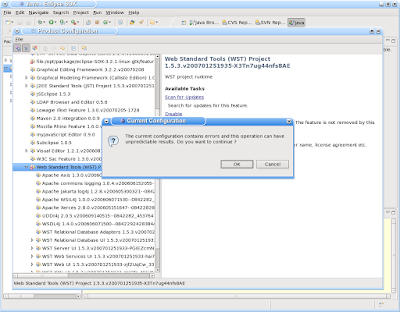 I've seen all sorts of nice features being added like the WTP project in it self. One thing that hasn't changed that much though is the update tool. Updating Fedora with yum is quite simple and relatively quick, but that's not the way I experience it with Eclipse. It seems rather slow and using to choose mirrors makes it very slow (haven't found the fast sites). I'm not all alone with that: Eclipse updates still lag behind. I have perviously updated with success, but now I've realized that I don't update Eclipse - I upgrade. This specification defines a SAML HTTP protocol binding, specifically using the HTTP POST method, and not using XML Digital Signature for SAML message data origination authentication. Rather, a “sign the BLOB” technique is employed wherein a conveyed SAML message is treated as a simple octet string if it is signed. Conveyed SAML assertions may be individually signed using XMLdsig. Security is optional in this binding. Defines a generic browser-based protocol by which a centralized discovery service implemented independently of a given service provider can provide a requesting service provider with the unique identifier of an identity provider that can authenticate a principal. This deployment profile specifies the use of SAML V2.0 attribute queries and assertions to support distributed authorization in support of X.509-based authentication. This related set of SAML V2.0 deployment profiles specifies how a principal who has been issued an X.509 identity certificate is represented as a SAML Subject, how an assertion regarding such a principal is produced and consumed, and finally how two entities exchange attributes about such a principal. This profile is a replacement for the X.500/LDAP Attribute Profile found in the original SAML 2.0 Profiles specification [SAML2Prof]. The original profile results in well-formed but schema-invalid XML and cannot be corrected without a normative change. I've never figured out why these announcements never mention what happens after the hearing is over, especially when the specifications are expected to become an OASIS standard. I can understand that in potentially someone could make a substantial comment that would require another round with the committee, but in general it seems like these specifications follow a slow by sure flow, so why not write something like this is the final review and afterwards they are expected to become standards in ex. April. Maybe they think that readers/reviews know the OASIS process by heart (we don't), they do not have a clue when specifications will finally become standards or they're afraid to promise anything (due to hard earned lessons). Back in July I looked at the last one in my post: "New SAML V2.0 X.500/LDAP Attribute Profile". The version I wrote about was the Committee Draft 01, 19 December 2006 which is just about a year ago from now. I just did a quick comparison between the two odt versions and it didn't look like it had undergone any significant technical changes, just a couple of textual corrections and the right intro with references. Based on this observation is sort of sad that it still isn't final, but maybe most for the writer (Scott Cantor) since the demand for attribute profiles looks low (Who needs SAML V2.0 Attribute profiles?). I haven't had time to look at the other specifications but maybe the new year will change that. In a previous post Sweetxml: Styling my WSRP portlets - does these CSS classes really give us common look-and-feel? I had a first look at the styling guidance that comes with portlet standards JSR-168 and WSRP V1. Here's a short description of two projects that I found actually use the CSS style classes. 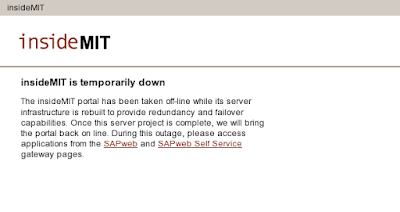 In the JBoss Portal 2.6.2 - Reference Guide under section Chapter 23. 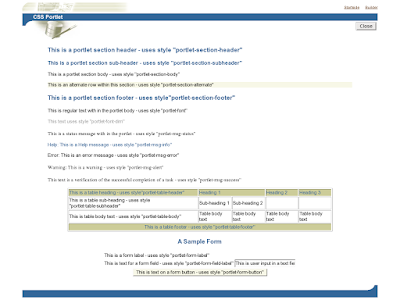 Layouts and Themes the subsection 23.7.3. List of CSS Selectors. 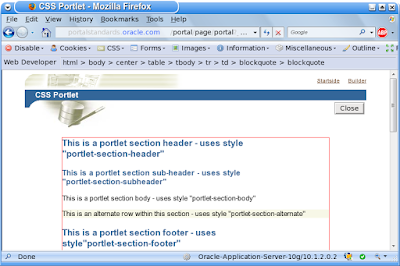 This is much more than described in the portlet specs since it covers the hole page and content elements that the JBoss Portal has for themes. The turnover to the portlet content is very clear, and the know classes are defined and some new ones like ex. the ones for the link pseudo-classes and some new ones called WSRP Selectors. Promote a uniform look and feel across all enterprise web applications and web sites built by Administrative Computing. Promote uniformity of the code used in MIT Administrative Computing web applications. Specifically, to promote the production of well-formed web pages. Provide guidelines intended to reduce the work required to support multiple web browsers and platforms. Promote "best web" development practices. This sounds very much like the intentions for the WSRP CSS-classes. This project uses some of the portlet CSS-classes as can be seen in Mapping of WSRP Classes to "Inside MIT" Applications . It's under half of the CSS-classes they (re)use, and unfortunately there's no explanation to this, but I guess it's simply that they don't need more. It's an intranet portal so I can't access and see the actual markup, but there's a short presentation of the InsideMIT Portal - hey no, it's publicly available but just not currently. Since I wrote my last post Styling my WSRP portlets - does these CSS classes really give us common look-and-feel? I've been looking for recommendations and best practice on this field of web design. In this post I'll list some of the best sources I've found and compare with an example by Oracle. Where the last one has the full crossover to microformats. which can be found alongside others on the Hosted WSRP root page with "WSRP/JSR 168 Sample Portlets". This example portlet is perfect to get an idea on how to use the classes. Before looking into the actual markup a run through W3C's Markup Validation Service gives:This page is not Valid HTML 4.01 Transitional! 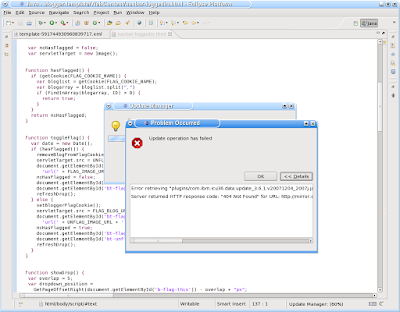 - Failed validation, 9 Errors. This is not that bad and most of the errors seem minor. This is a very resonale guess as to where the page template stops and the portlet starts. This is also of relevance as this concerns the use of section classes. Aiming to to be "4.01 Transitional" is a common choice, though strict would have been more correct in terms of the HTML 4.01 specification itself. The layout is clearly controlled by a tables and not through CSS2. The double nesting in <blockquote> elements is non-semantic. If I were to choose I would prefer using the corresponding table elements for header, body and footer. I can't figure out if the subheader is needed or could be done by <caption> and <thead>. 126         <td><input name="textfield" type="text" class="portlet-form-input-field"
130         <td class="portlet-form-label" colspan="2" align="center"><input name="Submit" type="button"
Like with the table part it seems redundant that the style classes repeat the element structure. 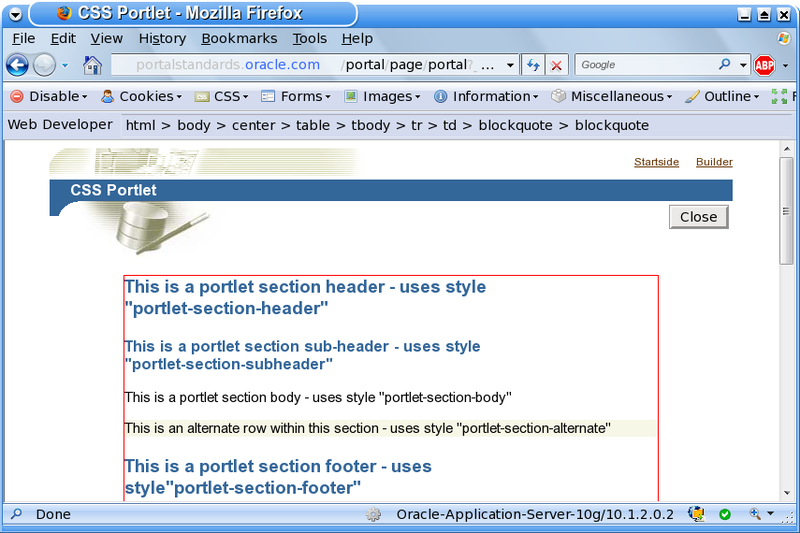 Semantic XHTML is considered best practice but it's hard to find in the portlet CSS classes. It is very nice that Oracle has taken the time to create an example for how the classes should be used. The missing part to conclude on is the complexity of the example and even more the richness of the design. The design chosen here is quite minimal and that might make this example more forgiving, as to which variants in the portlet markup would look right.